A pair of transformer explosions sent loud booming sounds through lower Manhattan on Thursday afternoon, officials said. 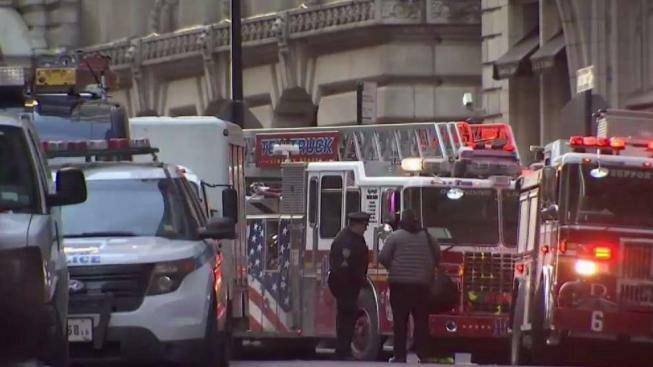 Fire officials said the blasts were caused by a pair of underground transformers that exploded at Nassau Street and Maiden Lane between 4 p.m. and 5 p.m. 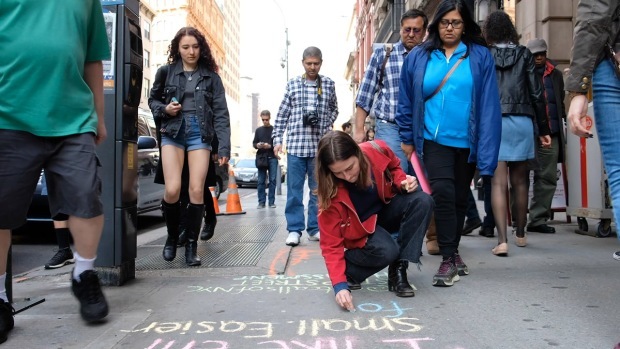 The blast sites are steps away from the Federal Reserve Bank of New York and just two blocks from the World Trade Center complex. Witnesses said that the rear end of a car on Nassau Street was lifted off the ground by a manhole that shot out of the ground in the first of the blasts. Social media videos showed the man standing on his own as he was checked out before being taken to the hospital. He was released a short time later. Another witness, James Rizzo of Brooklyn, at the scene said a manhole went flying about 20 feet in the air after the second blast. "It was a big explosion," Rizzo said. He added, "It sounded like a bomb." Social media users first reported hearing the blast shortly after 4 p.m.; NYPD spokesman J. Peter Donald confirmed the explosions were not nefarious in nature a few minutes later. Then, at about 5 p.m., the NYPD's First Precinct tweeted there had been a second blast on the same block. There was a 2nd manhole explosion on the same block. @NYPDSpecialops@FDNY on scene. @ConEdison is responding. Vehicular closures still in place. Will update. The Federal Reserve Bank was evacuated after the blast, according to officials, as were lower levels of two nearby buildings that registered elevated carbon monoxide readings after the explosions. The exact cause of the explosions wasn't immediately available, but subterranean fires and explosions aren't uncommon in New York City following wintry storms as snow and ice melt combine and pour into the sewer and utility systems. Lower Manhattan got 10 inches of snow in Wednesday's nor'easter. The NYPD said the roadways around the block are closed to vehicles while responders assess the situation. Con Edison was at the scene late Thursday making repairs. Chopper 4 footage from over the scene showed several fire and police vehicles in the streets near the site of the manhole explosion. Several people in the area took to Twitter to voice their concerns over the noise. 140 Broadway: Loud explosion at the corner from my job - had my chest in a pickle. I'm on the 34th floor and it was extremely loud and jarring. Our building just announced it was a manhole cover explosion and nothing to worry about. Gotta say, hearing a loud boom right outside my office building in Manhattan followed by sirens is a bit nerve-racking. See some reports that it was a transformer explosion.